As we reflect on the new year and what 2015 will bring, we find ourselves contemplating the importance of being present, cherishing each moment, and discovering the beauty in the details that surround us. Often we rush from place to place, our brains filing away what just happened and preparing for the next task at hand. Focused inward, we fail to notice, to truly see, what makes our campus home so wondrous. 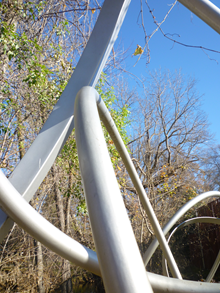 And so we decided to slow down and capture some of these, and hope that you, too, will delight in the details. 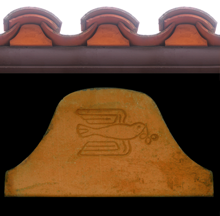 MCA (Maruhachi Ceramics of America, Inc.) is the only tile manufacturer to stamp its Eave Closures, otherwise known as Bird Stops, with this particular symbol. The image, a dove with an olive branch in its beak, symbolizes peace and good tidings. It was added after Yoshi (Murahachi) built the MCA factory in 1985 hoping that it would bring good fortune and prosperity to people. What a lovely symbol on the roof that shelters us each day! 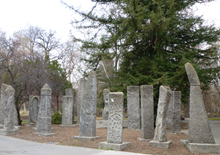 "Beside Ayres Hall, the art building at Chico State, is a series of sculptures that look like ancient standing stones. A few are signed – James Moody, John Hubenthal – though most are anonymous. The work has no label for a title or date. One stone bears a handprint as a sort of de facto signature that is at once more personal and more anonymous than a name. They lean. One seems to have toppled over entirely. 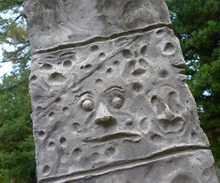 They bear markings and symbols that seem an eclectic catchall of ancient symbols.... They are a fitting accompaniment to Ayres Hall, to a department containing studio art practice and art history (as well as interior design and art education), as they are contemporary works, deeply steeped in historical traditions. One of the stones encourages the viewer, through an inscription, toward “Serenity, courage, wisdom.” I often see students sitting here, perhaps in the hopes of finding all three." ~ Asa Mittman, Professor of Art History at California State University, Chico. "We can be completely captured by the smell of a flower, the beauty of a tree, the sound of a child’s laugh, the elegance of a landscape, the wonder of modern technology, the taste of a potato chip, or anything else. When our attention isn’t on thoughts, this appreciation arises naturally. Anything can just overtake us when we experience it fully. General John Bidwell's generous offer of eight acres from his cherry orchard for the site of the Northern Branch State Normal School of California was accepted on April 8, 1887. 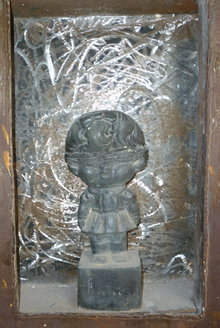 This metal plaque, along with 5 others, mark the corners of this gift. The fertile valley tract was rich with alluvial sediment from Chico Creek and other nearby rivers and streams descending from the Sierra-Cascade mountains. On that fertile ground has grown Chico State’s campus, now 119 acres and designated as an arboretum in 1982. "The world is so beautiful, when you look at it. So detailed. So sharp. Everything’s just there--so much more than we need. Light we can’t see, sounds we can’t hear. Sometimes I wonder if that’s what it takes to make it real." "There is ecstasy in paying attention... Anyone who wants to can be surprised by the beauty or pain of the natural world, of the human mind and heart, and can try to capture just that - the details, the nuance, what is. If you start to look around, you will start to see." "The beauty and mystery of this world only emerges through affection, attention, interest and compassion . . . open your eyes wide and actually see this world by attending to its colors, details and irony."